Sometimes you just need a movie that’s set up for success. Its characters may be going through things, and how it will all turn out is uncertain, but there’s still a positive outlook that things can’t get so bad, since the place at which they’re starting is decent if not all that exciting. Such films are at risk of being boring if they don’t present any conflicts or obstacles, but a feel-good movie has the potential to be just as good as a serious drama any day if done right. 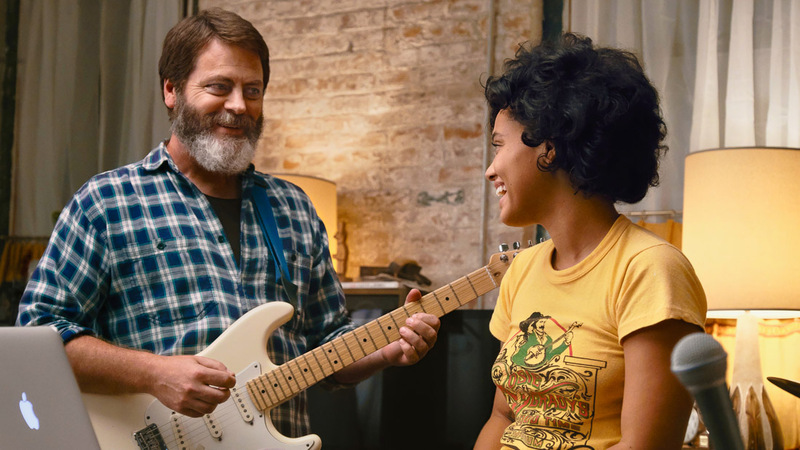 Frank (Nick Offerman) runs a record store in Brooklyn that isn’t doing well, and it’s not just because he refuses to talk to his less friendly customers. As his daughter Sam (Kiersey Clemons) prepares to go to college to study medicine, Frank reminds her how much fun they have jamming together, and when he hears her latest song, he realizes that they need to keep making music. After uploading their recording to Spotify, Frank prepares to shut down his store and hopefully start a band with his resistant daughter, a way of paying tribute to her musician mother, who was killed in a bicycle accident years earlier. Offerman is well-known to TV audiences as gruff manager Ron Swanson from “Parks and Recreation,” and it’s nice to see him shed that personality to create the definition of a wannabe-cool dad who likes what he likes and wants his ambitious and driven daughter to stop doing her homework so that she can jam with him. Clemons, who also has TV experience, is wonderful opposite him, and the two feel like a true family, even though their outlook on the world is very different. Toni Collette and Sasha Lane are both lovely as the romantic influences in their lives. This film’s plot is affirming and fun, with many jokes throughout, but what really makes it work is the music. Offerman and Clemons perform a number of songs, including the title track, and watching them make the music is only half the fun. This reviewer is particularly excited for an eventual soundtrack release since the songs are all terrific, and the performance of them on screen helps make the experience a delightful and energizing one. What could have been a decent, well-written comedy becomes something memorable and special thanks to both the acting and musical talent of its two leads.